Many of you have loads of Q’s about working in fashion…and I know it can be hard to find answers. Maybe you don’t know any industry experts to ask. Maybe your coworkers are tight lipped and not willing to share their secrets. Maybe you just don’t even know where to go. Which is why I’m excited to be back with another mailbag episode to give you fashion design career advice. 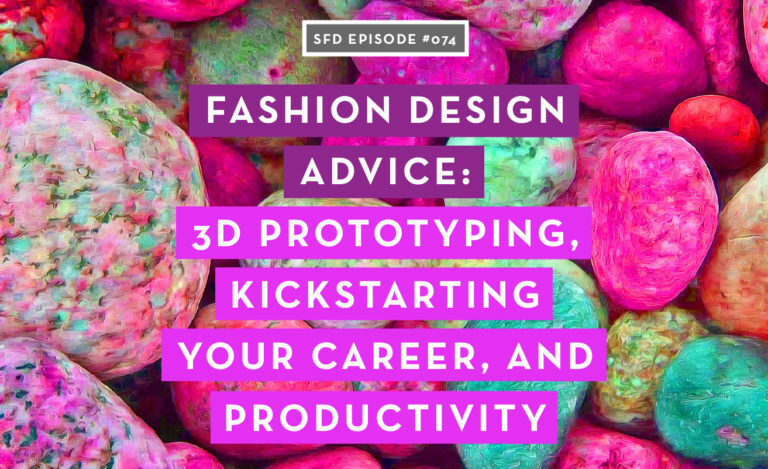 Once a month, I answer your Q’s on the Successful Fashion Designer Podcast. 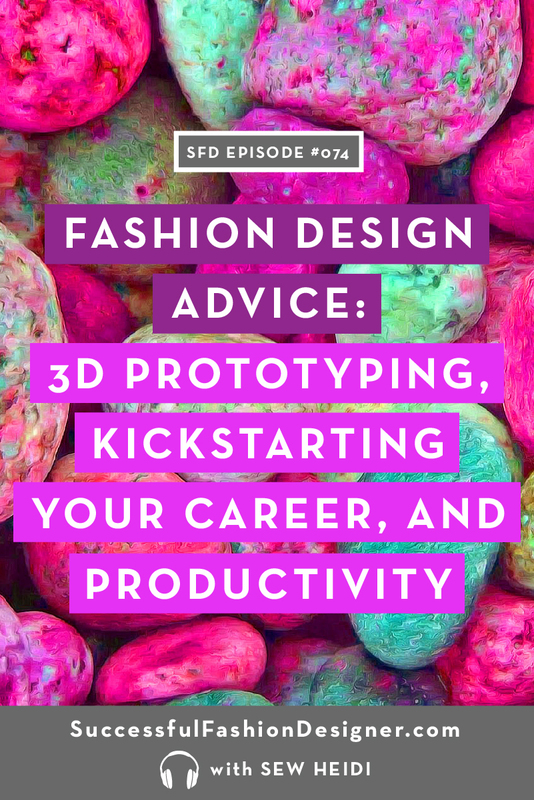 This month, I’ll be giving my best advice on 3D modeling, prototyping, kick-starting your career, and productivity. 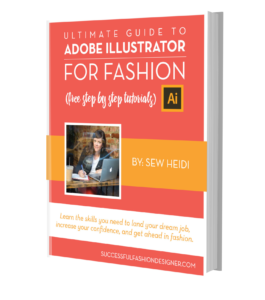 Here are the fashion design career advice questions I answer in this mailbag episode! I was curious if there would be any transition or talk about 3D modeling and how it’s becoming more and more an industry standard for both product developers and technical developers. More importantly design. In my industry 3D modeling is replacing 1st prototype (I work for [brand name redacted] in Apparel Dev). We are also curating libraries for trims in 3D software so it’s a full breath of garment and drape with all embellishment and decoration. Are you seeing this in your career as well? Crazy how shifts happen so quickly. I love listening to your podcast and feel like I have learned a lot! I know this is a long-shot, but I am desperate for some advice. I am creating a special denim line for woman and had a sample made by a US manufacturer. The sample took an unbelievably long amount of time and came back not at all reflecting my tech pack (they basically just re-created my rough proto). I decided to hire a company that works with startups to refine our tech pack and pattern file based on the fit testing. If I use this smaller company, I have to either choose pre-washed denim or outsource the wash process. With the larger (but less dependable company), it would all be done in the same facility for less per price cost (but higher minimum). Due to high shrinkage, I have to make a decision on the fabric in order to move forward with changes to the pattern. I have never gone through the manufacturing process before and really want to move forward. Do you have any advice you could share? Do you think it’s too late for me at this age (28) already? From your experience, what’s the difference between the designers that start early and the ones who come later like me? And this is a bit personal, if I may know, where were you at 28 y.o? What kind of life situation, job, finance, and what stage of your career at that time. As much as I wanna feel motivated that I believe I’m doing the right thing/ on the right track, it still sometimes hits my self-esteem and questioning my potentials and future. You mentioned that you didn’t have any fashion background before landing your first fashion assistant job, and now you’re very knowledgeable and skillful in apparel manufacturing. How long did it take for you to grasp at least sufficient knowledge to be confident in yourself that you know you’ve got what it takes? How do you manage to do everything? I see you have a lot of things to take care of. I want to know what your typical day is, what your routine is like from the moment you wake up and sleep. If you enjoyed this episode and have questions you want answered, email them to podcast [at] sewheidi [dot] com for consideration. I’ll pick the best ones and include them in the monthly mailbag show. Save this “Mailbag Episode” to Pinterest so you can find it later! 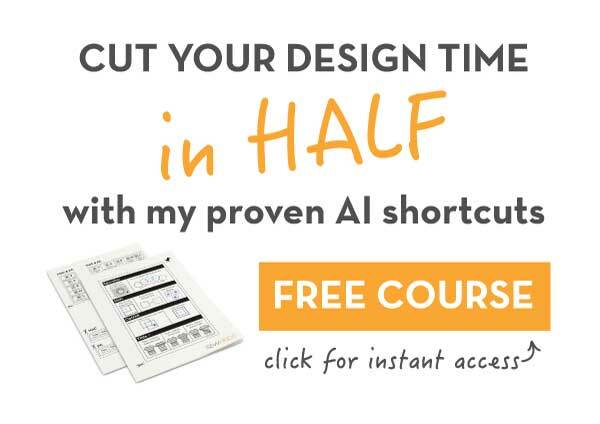 By signing up, you'll get access to weekly emails with free tutorials, templates and occasional offers.